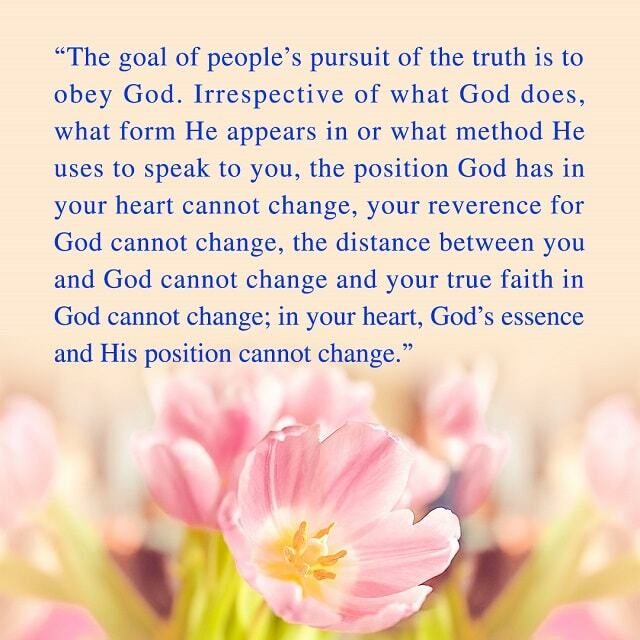 God says,“The goal of people’s pursuit of the truth is to obey God. Irrespective of what God does, what form He appears in or what method He uses to speak to you, the position God has in your heart cannot change, your reverence for God cannot change, the distance between you and God cannot change and your true faith in God cannot change; in your heart, God’s essence and His position cannot change” ( “Man is the Greatest Beneficiary of God’s Management Plan”). God says,“When you pray, if you have love for God in your heart and seek God’s care, protection, and observation, if these are your intent, your prayers will be effective. For example, when you pray at meetings, if you open your heart and pray to God and tell Him what..
God says,“Just as the moon always follows the sun, the work of God never ceases, and is carried out upon you, upon me, upon him, and upon all those who follow the footprints of God and accept the judgment and chastisement of God” （ “Beholding the Appearance of God in..